Ever Thought of Fussy Cutting a Block Center? Anita Eaton’s “Entwined Star” pattern is a variation on a “Twin Star” although Anita says that she actually started the star by experimenting with variations of nine patch stars rather than beginning with the “Twin Star”. Drawing a nine patch blocks on graph paper she arranged and rearranged line and color values until she came up with the “Entwined Star” variations. She says that she enjoys that method along with using EQ to do her designs. 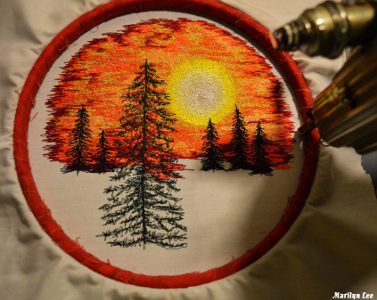 There are no real rules about selecting certain fabrics for your advanced stained glass applique project. However, my suggestions in fabrics will make the construction come together with ease. I suggest using all good quality patchwork cotton fabrics. The reason I suggest good quality is because low-quality cotton and other fabrics can fray readily, which is not desirable for this technique as it can easily pull away from under the bias binding. In particular, when making a design such as "Scarlet Rose" an advanced project which uses narrow bias, you do not want any fraying at all. Batiks and dyer's cotton are ideal as they have a high thread count. I am so excited to be able to publish my Block of the Month program and it is perfect for Spring! 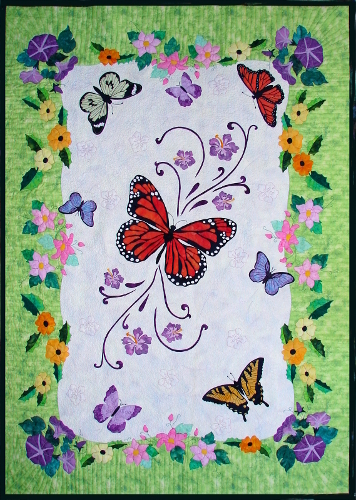 If you love butterflies, then you'll love this quilt too. I made this quilt for my granddaughter Amy as she just loves butterflies which is the theme for her bedroom. Perspective is an important aspect of pictorial quilts whether they are a landscape or still life and geometric quilts. The use of various forms of perspective can enhance the depth of the image making it more dramatic and creates the illusion of being three dimensional. Abstract is a wonderful word because it has many different subtle meanings. It can be a verb, a noun or an adjective.